Allow us to support you remotely. This is how it works: you download the Team Viewer application using the link provided below. Click on the appropriate link above (Windows or Macintosh version) to download the team viewer support program suitable for your computer. We recommend to save the file onto your desktop. Remember that you must execute the file after downloading by double clicking the icon to start the remote control session. 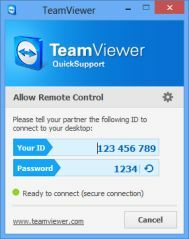 Call us on the phone and tell us your ID and the Password that you see on the Team Viewer screen. We will then be able to connect to your PC remotely and solve many issues or demonstrate the use of your computer.